A perplexing wooden cabinet looms on the stage -- its weird speakers spinning. I&apos;ve been to my fair share of live music events but never seen anything like it. "It&apos;s a &apos;Leslie,&apos;" music sage and resident sound guy &apos;T-Bird&apos; tells me. Named after its inventor, the cabinet&apos;s revolving speaker produces a shuddering tremolo effect for the sound that moves through it. It is a peculiar but delightful relic from a time when things were handcrafted with meticulous detail, an apt metaphor for this repair shop turned food haunt. Garage On Beck is somewhat out of the way and tucked among oil refineries, yet stretch your neck and you can almost see the Salt Lake City state Capitol Building from here. At first glance, one is given the impression of a dingy biker bar. A marquee with a bright neon martini and arrow signed "Eat" hangs on the side. The lone word "GARAGE" adorns the weathered facade of this wood and tin box. It&apos;s not immediately apparent to visitors if the weathering is deliberate or the result of time. But I know what awaits inside. I know because I used to work here. What is now one of the fun places to eat in Salt Lake City was originally a mechanic garage in 1947. 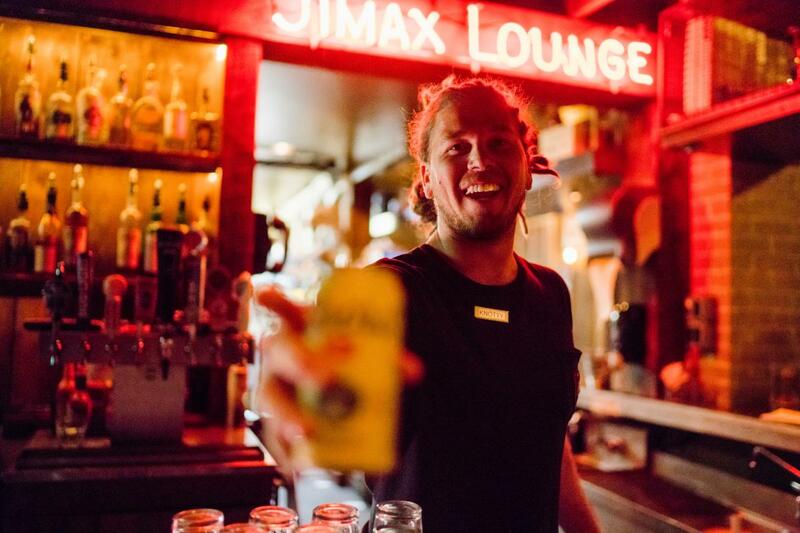 The location&apos;s first transformation began in 1976 when married couple, Jim and Maxine, bought the spot and turned it into the bar, Jimax. In 1985 it changed hands and became Rose&apos;s Jimax Lounge, until being purchased by its current owner, Bob Mccarthy, in 2008. An intense and jovial personality, Bob self-identifies as a New York City Italian and SLC transplant. He&apos;s the kind of guy who obsesses over detail. Bob appreciated the history and character of the bar, motivating him to take a particular approach during the renovations. He described it as, "Taking something old and bringing it back to life. Not being embarrassed by any part of it. Even accentuating those parts." Take a look around the Garage. 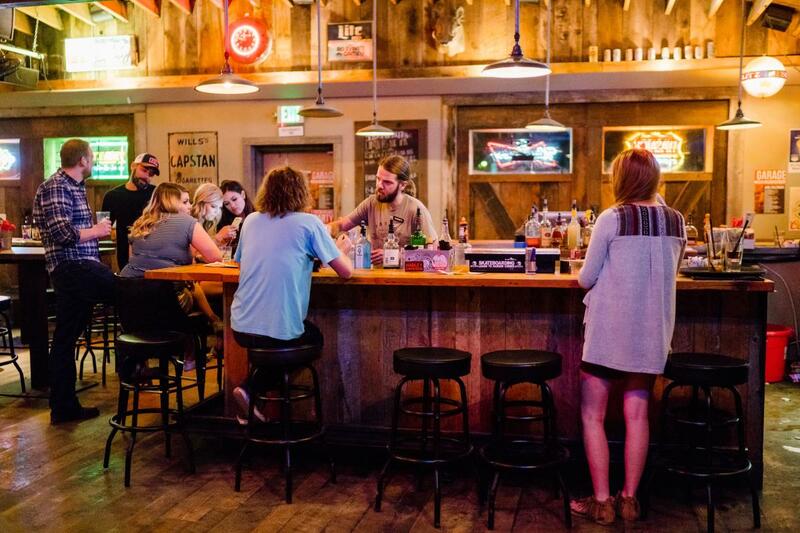 Most everything is fashioned out of aged wood: the floor, the tables, the bar. An iconic Christmas Story leg-lamp lights up a corner of the rafters. A boar&apos;s head hangs on a wall alongside other 1950s bric a brac. Angelique, the GM, jokingly describes the aesthetic as "leftover-antique-store." There&apos;s truth to her words, but the space is by no means tacky. Each vintage artifact chosen with care and deliberately placed creates a ghost-haunt feng shui. 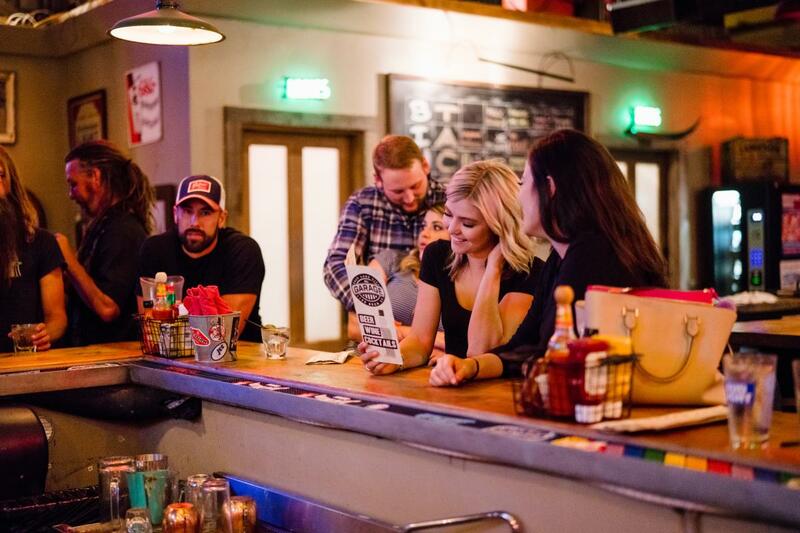 This location draws travelers and locals with food, fun, drinks and atmosphere. In the world of chain restaurants, "authenticity" is a familiar marketing strategy. Chain restaurants often toss around phrases like "authentic Italian cuisine." Bob doesn&apos;t buy it. "You can&apos;t fool people. They want something real." Sitting at the front bar with the bearded bartender, Spencer, we exchange some banter and hearty laughs as I browse the menu and enjoy a stein of cheap beer. For the regulars, of which there are many, the staff accounts for much of the draw. Friendly, blunt and boisterous, most have been here for several years. For me, these people are family. This isn&apos;t an accident. Bob intentionally cultivates such an environment. For him, having workers develop strong bonds is an essential part of a successful business model. "I don&apos;t know how you do it without that." 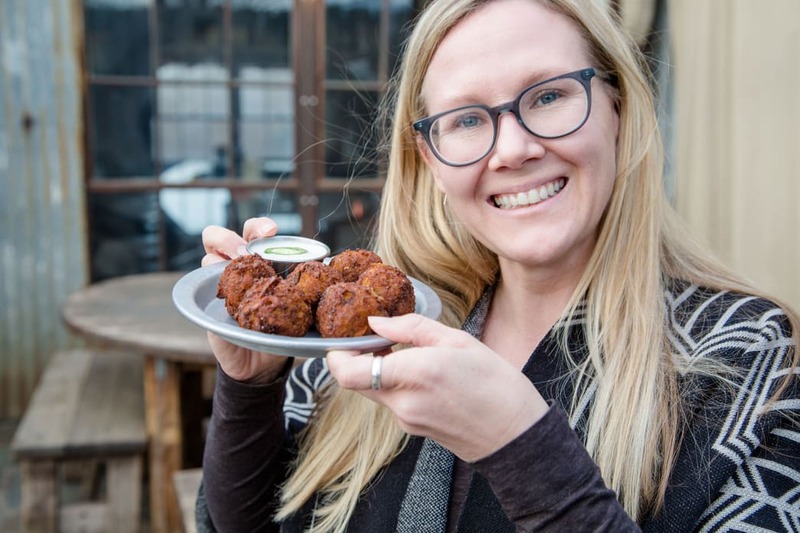 Another reason why Garage on Beck is one of the fun places to eat in Salt Lake City. Ordering the daily special is always a go-to. Today&apos;s special: homemade mac and cheese with peppers and ham under garlic bread. The eats here are quintessential bar food, but it&apos;s all made from scratch. Nachos piled high with veggies and meat. Onion rings stacked and presented on a "golden" spike, a nod to the Northern Utah national monument that marks the meeting of the First Transcontinental Railroad. Burgers with beet haystack, creamed horseradish and cambozola cheese. But the crowning achievement is the Mormon Funeral Potatoes: Idaho Potato balls with cheddar, jalapeno, bacon, scallions, and a cornflake crust. Baptized in hot oil and served with Utah Ranch. Perfection. Come for your favorite dish and stay for the music. Outside in the garden patio, the musical act is about to begin. I meander past the cast iron stove, through a garage door, and over flagstoned ground to grab a butterfly chair in front of the stage. Like most everything else at this bar, the scenery has a strange beauty. Behind the green trees and shrubs that line a slat fence, mighty cement refinery columns shoot fire into blue sky. A strange toxic sublime. 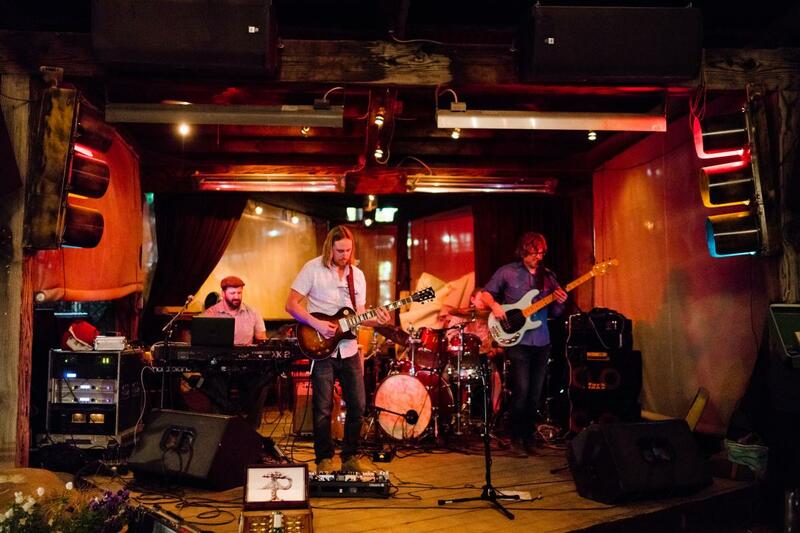 Garage On Beck is as much a reputable concert venue as it is a dining destination. Their music line-up follows a weekly pattern, each night a distinct atmosphere. Thursday is jazz night. Really love jazz? 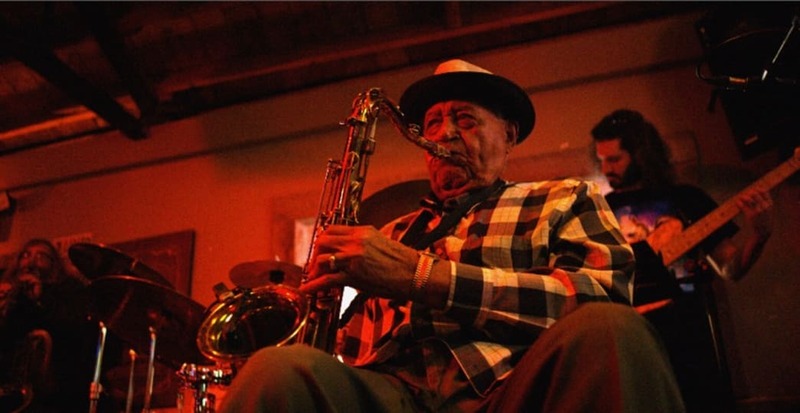 The first Thursday of each month features Joe McQueen, also known as Utah&apos;s Godfather of jazz. As in, the guy was practically there when jazz was invented. As in, he&apos;s 98 years old and you must see him now. 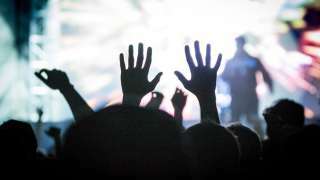 Friday and Saturday are typically rock shows that bring in the good-time crowd. Sundays often offer local acoustic sets, usually free. Tonight is Saturday and I&apos;m watching Austin, Texas transplant Garrett Lebeau. A synthesis of Blues and Soul, Lebeau shares personal experiences over unobtrusive guitar and bass rhythms, light keys, and steady percussion. His smooth voice walking in step with the storytelling-tempo. Sitting in what I can only assume is a dentist chair taken from a &apos;50s horror flick, Lebeau, band manager &apos;Hazmat&apos; and myself chat upstairs in the green room during intermission. Similar to his music, Lebeau speaks with a soft, even voice. He is deeply articulate and lucid; I find myself thinking this belies his 7th grade education but then gravitate toward a roughly formed notion of his artistic prowess. There&apos;s a wisdom about him I suspect was born out of relying on intuition unmuddied by the ideas of others. Hazmat, an Austin music industry vet, shares what moved him to work with Lebeau. "Garrett&apos;s music is interesting. Melodically. Lyrically. Harmonically." he says. "There was something about him that drew me in." I ask Lebeau about his creative process and we touch on the paradox of trying to produce &apos;authenticity&apos;. For me, it&apos;s like searching for shadows with a flashlight. Talking about his approach, Lebeau says, "I imagine authenticity as a kind of mist that surrounds me. When I sit myself down to write, I breathe it in. Allow it to work through my subconscious." It&apos;s a mist that seems to revolve around Garage on Beck and work through Bob. Written by Mitchell Reber for Utah Office of Tourism.